If you were to compare your marketing strategy to man’s best friend, what age would you be? Are you an eager, enthusiastic puppy, ready to get your hands into everything and maybe making a few messes along the way? Or you a senior pup, content to lay on the couch and stick to your old ways? In content marketing, you can be an old dog, just with mindset of a young one – especially when social media is involved. So says Brafton Social Media Strategist (nay, Starlet) Rachel Moskowitz. If there’s anyone who knows the amazing power of social (and the positive effect a great social strategy has on our clients), it’s her. Although Rachel became a Brafton employee in July 2017, her experience with the company extends to 12 months prior. Rachel was one of our social media interns, and she spent the summer before her senior year of college in our Boston office. Lucky for us, the experience convinced her that Brafton was where she was destined to work. It might have been a given at the time, but growing up, Rachel was attracted to a world far removed from social marketing. Lucky for Brafton, Rachel chose media communications with a minor in journalism over angsty vocals in college. She attended the University of Delaware, interned with us in Boston, finished her senior year and came right back. 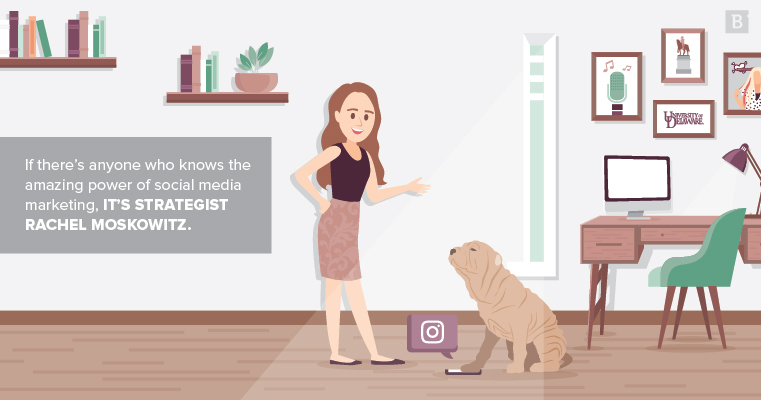 Though Rachel’s tenure as an official social media strategist has been short, she’s not lacking for any industry knowledge or insights. In fact, she’s the first to admit that a person in her role has to be completely aligned with the industry in order to thrive. She pointed to Snapchat and Facebook to emphasize her point, noting that the former’s updates excel at annoying its user base and the latter’s response to privacy concerns inhibits its full potential as a marketing platform. Currently, elsewhere often means LinkedIn and Instagram. It’s important that every day we find the right solution [for our clients]. Of course, given that social media is one of the fastest-changing elements of content marketing, Rachel needs to be prepared for all the trends that are coming next. Her prediction is that video, which we’ve already identified as a must for 2018, will catch the eye of more and more businesses. Given that LinkedIn finally added video ads to its repertoire, it’s safe to say that Rachel knows what she’s talking about. The way Rachel tells it, social media is a must for any business hoping to generate leads online – regardless of the industry. In fact, when asked what she wished everyone knew about social media marketing, Rachel immediately pointed to its value. The way Rachel tells it, teaching old dogs new tricks is all about showing them great results.